Charlie Barnet (October 26, 1913 – September 4, 1991) was an American jazz saxophonist, composer, and bandleader. His major recordings were “Skyliner”, “Cherokee”, “The Wrong Idea”, “Scotch and Soda”, “In a Mizz”, and “Southland Shuffle”. Charlie Barnet was born in New York City. His parents divorced when he was two, and he was raised by his mother and her grandparents. He learned to play piano and saxophone as a child. He often left school to listen to music and to try to gain work as a musician. 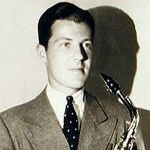 By sixteen, Barnet had done road work with a Jean Goldkette satellite band and was in New York, where he joined Frank Winegar’s Pennsylvania Boys on tenor sax. Always restless, by 1931 he had relocated to Hollywood and appeared as a film extra while trying to interest local bandleaders in hot music, which was increasingly unpopular due to the Great Depression.